Starwood has interesting rate promotion for stays at participating hotels in Europe, Africa & Middle East and that are paid using MasterCard. When you booked 2 or 3 nights you get 1 free night (3 or 4 nights total stay) and when you book 4 nights you get 2 free night (6 nights stay). This offer is valid at participating St. Regis, Luxury Collection, Le Meridien, Westin, Sheraton, Four Points and Aloft hotels. 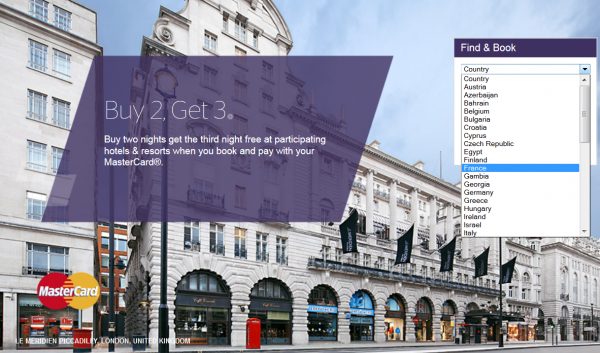 When you use the offer link above, it shows which of three promotions each property is participating to. Most of the hotels participate to all three but there are some exceptions. The end date of this rate promotion is unclear. 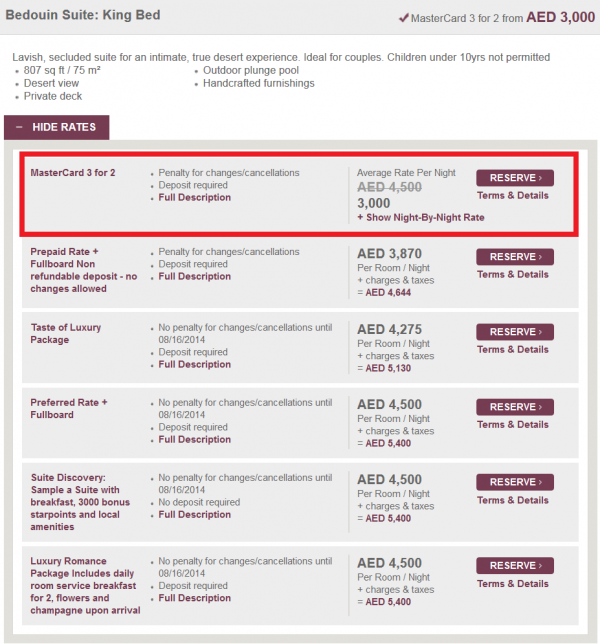 This is one of those rate offers that you should consider if staying 3, 4 or 6 nights at any of the participating hotels. This can yield the lowest rate if other discount offers are not available. The terms state that you should pay using MasterCard but this is each of the individual hotel to enforce. The Promotion is valid only for MasterCard cardholders. The offer(s) apply to the hotel room rate and room tax only. Other hotel charges, service charges and applicable taxes (other than the room rate and the room tax) must be paid for by the MasterCard cardholder in accordance with the cardholder’s agreement with the hotel. Offer is only valid for a three-night minimum/maximum length of stay. Offer is only valid for a four-night minimum/maximum length of stay. Offer is only valid for a six-night minimum/maximum length of stay. A cardholder’s booking and/or stay pursuant to this Promotion will be subject to the Starwood Terms and Conditions and Privacy Policies. This Promotion is not valid for bookings for groups of 5 rooms or more. Full pre-payment for all accommodation must be made using a MasterCard card. The products and services offered under this promotion are provided solely by Starwood, under such terms and conditions as determined by Starwood, and MasterCard accepts no liability whatsoever in connection with such products and services. Arrival days may vary for each property. Offer must be booked and paid for with a valid MasterCard. Basic room rates do not include additional per room per night charges that may be imposed or state/local taxes. Rates are per room per night based on single/double occupancy and offer is subject to availability. There are no credits for any unused free nights if the guest checks out early. These offers are based on Starwood’s best available unrestricted retail rates. Advance purchase required. Credit card will be charged at time of booking. Reservations cannot be changed, are pre-paid and non-refundable; if cancellation takes place, guests forfeit total room charge plus tax. Starwood reserves the right to discontinue this offer at any time if the MasterCard Starwood agreement is terminated in accordance with its terms. Previous articlePREVIEW: Marriott Rewards Fall 2014 MegaBonus September 15 – January 15, 2015.